day, as long as the sun is shining, they become unpleasantly hot, bright and uncomfortable to sit in. Exposed to persistent, brilliant sunshine plants wither and furnishings and fabrics fade. 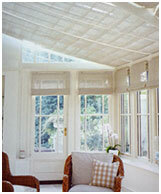 Light must be controlled if a conservatory is to be used to its full potential. 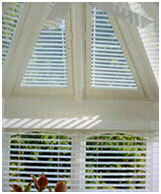 However large or small, whatever the shape of the roof or windows, shading your conservatory is no longer a problem.